The Quantum Long Sleeve Hood from Icebreaker is a midweight jacket that’s packed with premium features to keep you comfortable in the cold, weather you’re pounding the pavement or hitting the trails. The Icebreaker Quantum Long Sleeve Hood for women is made from a blend of merino wool and elastane, making it naturally resistant to odor, moisture wicking, breathable and fast drying. An eyelet mesh increases mobility and venting, while a drop tail hem design combines with a fold over cuff to increases protection from the elements. The Quantum Long Sleeve Hood from Icebreaker also features a zippered chest pocket with a built-in media port so you never have to go without your beats. Icebreaker Quantum Hood Sweater - Women's: One of our most popular styles, the Quantum is a long sleeve zip hood from the Technical Mid Layers collection. Made from stretchy, midweight 260gm merino, this classic hood is ideal for running, cycling, hiking, skiing and other outdoor activities. While at the same time it looks great for casual weekend wear. The features are all about performance, from the shaped zip to the reflective two-way zipper. We've added eyelet panels for ventilation and thumb loops to anchor the hands. Technical Mid Layers are advanced performance layers for high intensity sport. Made with a little LYCRA for a perfect fit, they're highly breathable, fast drying and odour resistant. 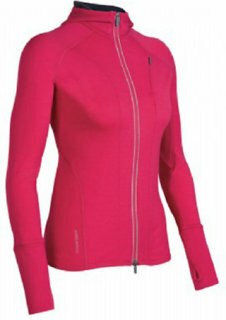 FEATURES of the Icebreaker Women's Quantum Hood. SPECIFICATIONS of the Icebreaker Women's Quantum Hood. An essential layer to give you all the protection you need against the elements. The Quantum Hood is fully lined, and has zipped front stash pockets, a shaped hood, a two-way reflective zip and design details that will give you the ultimate in freedom of movement. Eyelet panels for increased venting. 20 people have already set their own price.